For the purpose of convenience, efficiency or cost-saving, clearing boring locations for utilities and drilling are often scheduled on the same day. However, this practice has its downside: clearing boring locations on the same day as drilling may not be as thorough as it could be. In other words, the risk of hitting underground utilities are often not minimized. Why? It could make sense...each boring location is cleared first and the drilling will follow; while the drilling is happening at cleared locations, the utility locator can work on other proposed drilling locations. We have a utility locator on site and give him ample start time, two hours for example, before we are going to start drilling the 1st location he has cleared. He has now cleared that 1st location and we start drilling. That is good enough right? Not necessarily. He has cleared the location in a parking lot, later on when he tries to clear a boring location in a grassy area about 50 feet away from the first location, an manhole covered with dirt is found. After the manhole cover is removed, a storm drain pipe is found leading from the manhole toward the first boring location. The pipe was too deep for the Ground Penetrating Radar (GPR) to see it in the first boring location that was cleared in the parking lot. Is that 1st location really OK to drill then? No. For another example, it's not uncommon that an underground utility line from one side of a building can be traced all the way to the opposite side of the building, where there could be no sources for tracing or evidences that it even exists. If an utility locator tries to clear a boring location as fast as possible, he might have limited his search perimeter to only one side of the building, and some utility lines could be missed. If you really want to be thorough in clearing a boring location, you need to expand your search perimeter as wide as possible. In this sense, clearing additional boring locations is expanding the search perimeters of the locations previously surveyed. In a survey area or a site, the more locations surveyed, the less of a chance there is of missing utilities at all of the surveyed locations. So the practice model of drilling at each location immediately after it's "cleared" is not necessarily the best way to proceed. If you schedule the boring clearing and drilling on the same day, technically you are rushing the utility locator, although unintentionally. You can say "take your time, no rush", but it's definitely a pressure when you have a drilling crew standing by waiting for you. 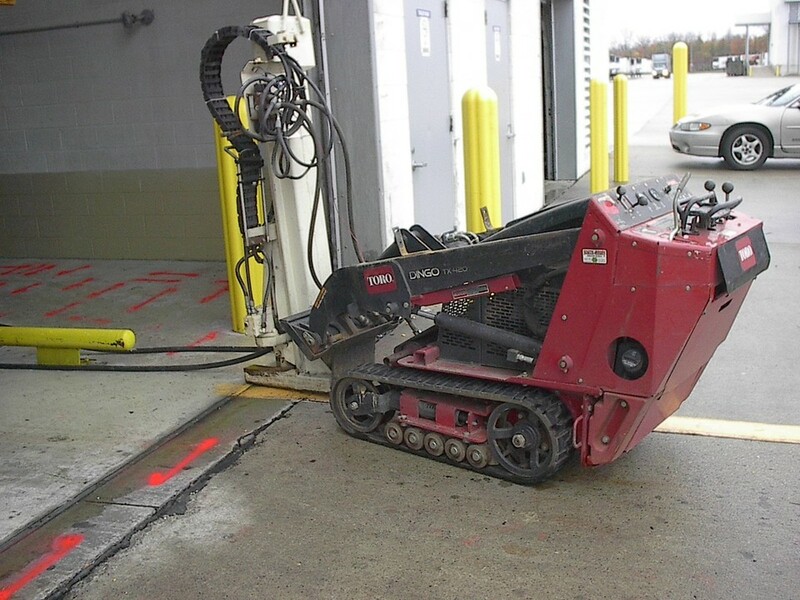 For clearing boring locations, although there is usually a general practices in every utility locating company for locators to follow, the actual practice done by a locator depends on the site condition and the locators experience. There isn't a sharp boundary upon which a locator can say a location is definitely cleared or not. The more time a locator spends on a site, the more confident he will be with the survey results at any given locations. The moral of the story...whenever possible, try not to schedule boring clearing and drilling on the same day! But if you have to, try to be patient while waiting for the first boring location to be cleared. Before giving the green light for the first boring location, an experienced underground utility locator will try to minimize the risk by getting a good feel about the whole site, or at least a relatively large area around the location, not just a single point or a 10-ft x 10-ft box. This could include carefully reviewing site plans, visual inspection of both interior and exterior portions of the site, etc. All these activities in addition to the actual locating take time. Be patient! Our technicians are trained to follow our proprietary "10-Step Utility Locating Protocol" reducing room for error! Download your copy here! Then call Utility Survey Corp. for all your utility locating needs! 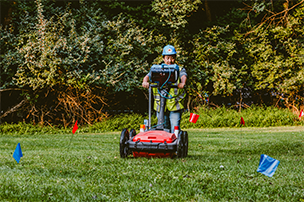 How Deep Can You See with Ground Penetrating Radar (GPR)?